Tigger: [giving the letter to Pooh to send to Santa] Get that to Santy hasty-posty. Winnie the Pooh: [at Tigger's door] Ho, ho - ho? Tigger: [closing the door] Gasp! Santy Claws! Tigger: That's him! Though I always thought he was taller. Winnie the Pooh: Um, it's awfully cold out here in the cold - if I could come in? Tigger: [opening the door a third time, then closing it] Why sure, you - HEY, wait a minute! Isn't Santy Claws supposed to come down the chimaney? Winnie the Pooh: [looking up to Tigger's roof] Ohhh - ho, ho, ho... bother! Tigger: [singing] Oooh, Santy Claws is coming down the chimney! Santy Claws is coming down the chimney! 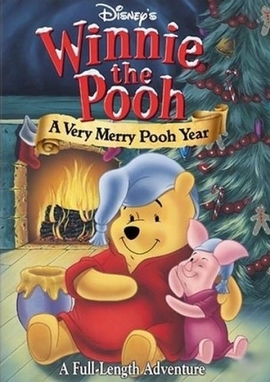 Winnie the Pooh: [after he goes personally to take the letter to Santa but the wind blows it away] Please come back! I'm supposed to take you to Santa! Winnie the Pooh: [Pooh is pretending to be Santa, talking to his reindeer, which is really Piglet] On lawn chair, on badminton! Up, up, away! Eeyore: [upon Pooh's return from sending the letter to Santa again] Hooray. How wonderful. Winnie the Pooh: Hello, Rabbit. Your honey invited me in.